When moving into a new apartment, condo, or townhome space is something that is usually a concern. Many people think you cannot own your dream furniture due to the lack of square footage. Downsized living does not have to be about sacrifice, you can make the most out of every square foot in your space with stunning furniture. Finding furniture that is smaller without substituting quality doesn’t have to be a difficult task. We're here to make things a lot easier for you with our top picks for small scale furniture. Yes, you can have a sectional in your apartment, condo, or townhome! The Rosslyn Sectional by Belfort Essentials is perfect for open floor plans. You can still host a party for the Big Game at your house with this sectional that provides plenty of seating. It’s 94 inch by 37 inch frame is a great option if you still want that comfortable sectional feel without taking up the whole living room. If you’ve wanted a traditional hardwood dining set but have a smaller sized kitchen. The Nook Collection by Kincaid is the perfect solution. The collection boasts a few options in small to medium sizes that can accommodate 4 to 6 guests which are perfect as apartment sized dining sets. This 44 inch table can seat the whole family comfortably making your kitchen or dining space the perfect place for family meals. For a more modern option, the Kai Dinette by Amisco is a great choice. This contemporary dining set can seat up to 5 people comfortably and features clean lines, a smaller frame, and mixed materials with wood, fabric, and metal. You can customize your fabric and finish options to create the perfect small scale dining room set. Living in a small home, apartment or condo shouldn’t mean that you can’t have a Queen or King size bed. 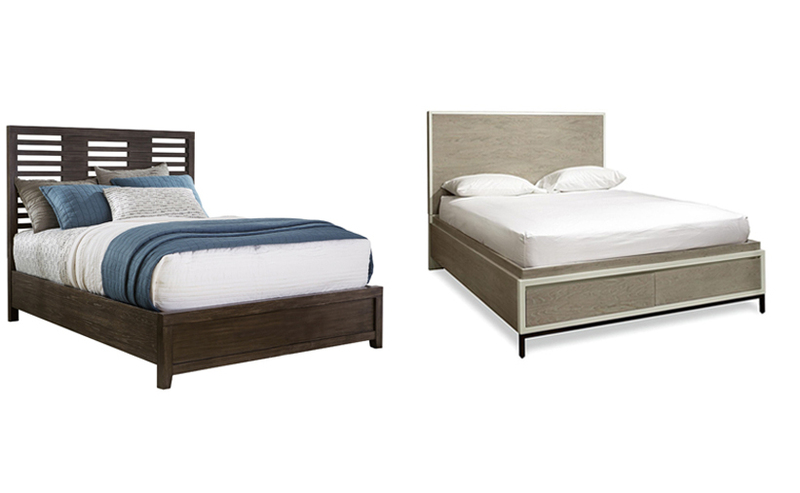 These smaller scale bed options are perfect options for smaller spaces. The Curated Bed by Universal and The District Bed by Belfort Select have smaller size frames but don’t compromise any of your sleeping space. This allows them to fit in smaller rooms without taking up too much space. The Cambridge Storage Bed by Aspenhome will make the most of a smaller bedroom and limited closet space; the 2 storage drawers that are located at the foot of the bed will replace the need for a bulky chest leaving more open space in the bedroom. Each drawer is spacious and features smooth gliding drawers. The Cambridge Bed and accompanying storage furniture are available in three different finishes; brown cherry, black and eggshell. Living in a smaller space doesn’t have to be about sacrifice. Collections such as these make downsized living simple. There is no need for huge clunky furniture. You can still have beautiful and spacious rooms despite square footage. 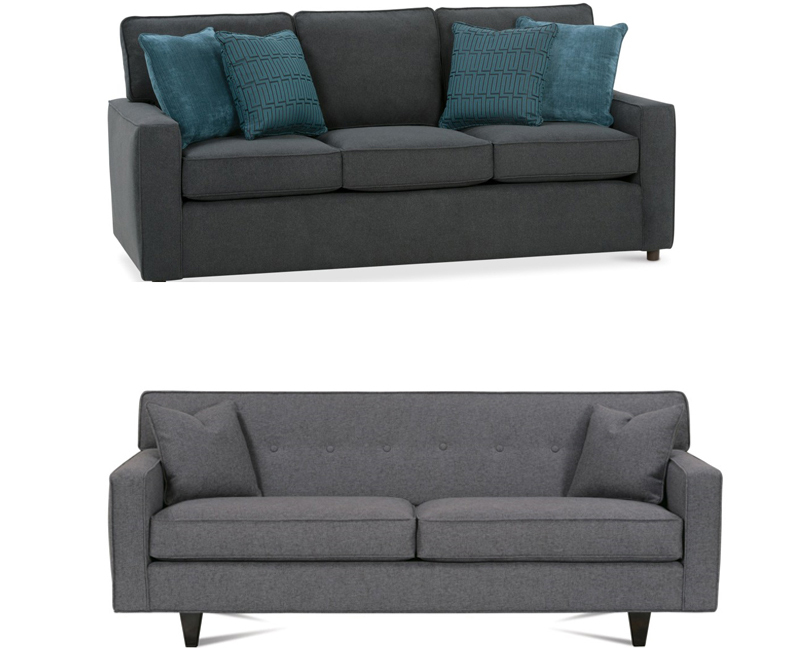 Shop these styles and more furniture at Belfort Furniture in Sterling, Virginia. Visit our showrooms for a variety of furniture styles and prices. Browsing through our 100,000 square feet of showroom space will surely inspire you.